Many websites expect their visitors to use a large monitor, where all text appears in a large enough font, or a mobile device, which typically uses its own "CSS style sheet" (a special language that determines the appearance and fonts used by web pages). 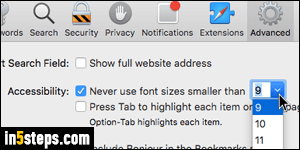 But, without even covering the accessibility settings in Mac OS X, Safari comes with functionality that lets you change a web page's font, and a "minimum text size" setting that you can customize! First, let's show you a useful tool in Safari's View menu: whatever page you're on, you can click on the View menu and choose a zoom level. By default, the entire page will be zoomed in (or zoomed out, if you want to make the page smaller so that it fits in your browser window). 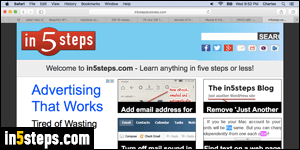 Contrast the first screenshot, which shows in5steps.com at 1:1 scale, and this one, zoomed in a bit. Instead of always going through the View menu, you can learn these three keyboard shortcuts: zoom in with Cmd++ (hold down the Command key and hit the plus-sign key). Zoom out with Cmd+- (hold down Command and press the hyphen / minus sign). Disable zooming and go back to 1:1 scale by pressing Cmd+0 (Command key and zero). You'll remember them after a few uses! Also notice a special setting in the View menu, visible in the previous screenshot. Safari zooms the entire page by default; but if you click the Zoom Text Only option, it will make the text larger only, without affecting any other element on the page (like images, video players, etc.) 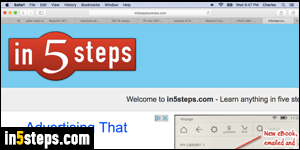 This screenshot shows in5steps zoomed in, this time with Zoom Text Only enabled: mixed results! Now onto minimum text size: click on the Safari menu and pick "Preferences". Select the Advanced (gear icon). 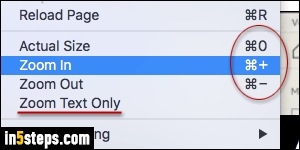 To force Safari to automatically use a larger font if it isn't at least as big as "x" pixels, check the "Never use font sizes smaller than..." checkbox. Then, pick a minimum font size. 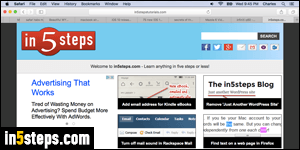 Try visiting your favorite websites to test things out, and keep changing the minimum font size until you are satisfied. You can now close the preferences window!